It only took him thirty years but the Austin-based guitar god Eric Johnson has finally released a solo acoustic effort titled EJ and the patrons at the City Winery in Nashville got to taste test the tracks first hand and evaluate his new approach at an intimate performance on November 6, 2016. Eric Johnson opened the show with several numbers on acoustic guitar. “This is too much of a pressure gig being in Nashville playing guitar,” Johnson said following an opening pair of songs on acoustic that included a cover of Simon & Garfunkel’s “Mrs. Robinson”. This famous song found Eric crafting both the lead and rhythm like the original with added nuances, strums and taps. He continued, “I’m too nervous to do this, I’ll see y’all later”. But, Johnson didn’t need to be worried. Sure, he didn’t have the stacks of amps to hide behind and he wasn’t able to make the layered sonic wall of sound with the inviting tone that he’s known for and that has won him numerous accolades as one of the planet’s most proficient players. Still, this wasn’t completely unknown territory for the Texan who regularly includes a short solo set in his band shows. After singing “Gift of Love” and showcasing some pretty picking Eric said, “This is off the new record called EJ and I found out that was probably a good thing to call it because that’s Elton John’s initials. So, I’ll probably sell some records,” he remarked to laughter before introducing a fluid and melancholy song about an unhappy knight called “Fatherly Downs”. Throughout the evening’s hour and twenty-five minute performance Johnson played a number of songs inspired by historical persons or in tribute to real people and musicians. Case in point was “Tribute to Jerry Reed” dedicated to the Nashville legend who himself was recently posthumously enshrined in the city’s Musicians Hall of Fame. Continuing that theme “Divanae” was for an artist from Italy. During Eric’s vocal numbers you’ll find that Johnson doesn’t sing like you might expect a Texan to because there’s no hint of a twang. It seems his approach was influenced by the British Invasion acts like The Beatles and Eric Clapton yet there’s something stylistically that is distinctly all his own that is almost otherworldly and completely captivating at the same time. “Different Folks” was for the various people he has known in his life while the intricate “Song For Irene” was written for his mother and is the closing track on the new release. “My Finest Champion” was dedicated to a mysterious figure who provided good guidance to the artist early in his life. 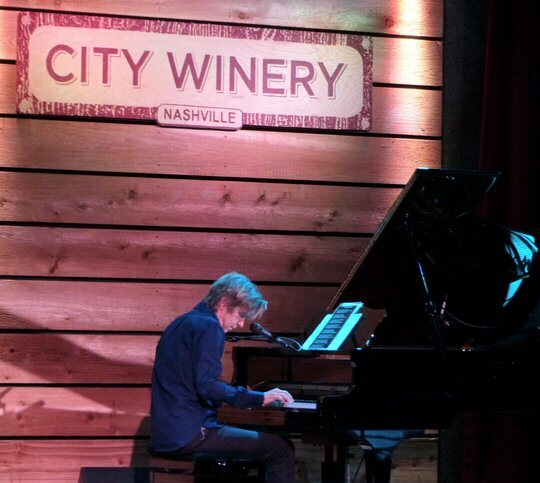 The Texas-based guitar slinger showed off his piano skills in Music City. “Let a Friend Find You” was a brand-new song that segued into “Desert Song”. Johnson said that after that he was going to break out “Smoke On The Water” and then he would set fire to his acoustic. He didn’t but his guitar playing was hot throughout the set. Johnson then moved to the large grand piano at the back of the stage for “Water Under the Bridge” that he said was really “Bridge Over Troubled Water” played backwards. It was hard to tell if he was kidding because he seems to be in a phase that’s found him immersed in Paul and Art’s signature songs. There are two of their covers on EJ and the show at the City Winery also closed with the additional “April Come She Will”. Next, Johnson introduced his friend from Nashville who performs simply as “Arielle”. Together they presented a song they wrote together called “To Be Alive” that was a serious look at life and what we as adults leave to children along the way. Johnson finished up strong with two guitar tunes. The first was for his friend and electric guitar inventor Les Paul. “The World Is Waiting for the Sunrise” contained the signature licks that The Wizard of Waukeshae” became known for during his remarkable career and life. “Once Upon a Time in Texas” was a high-point of the night as Johnson burned a path up and down the neck conjuring up a hot day in the Lonestar State. 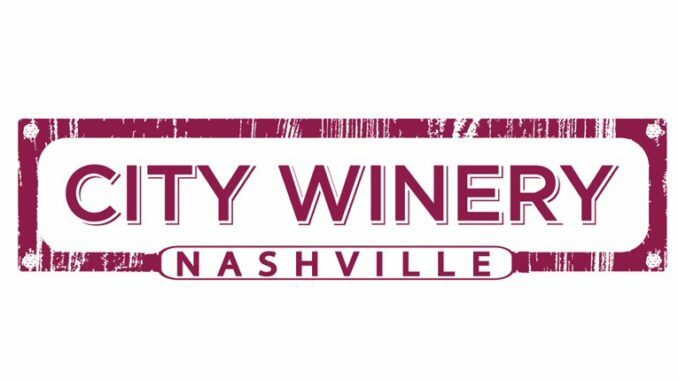 The City Winery located at 609 Lafayette Street in Nashville is an up-scale venue with an innovative menu and wine list. 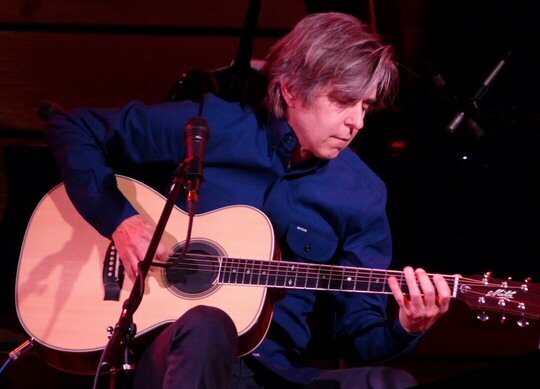 They continue to host an eclectic blend of artists such as Eric Johnson. Upcoming events at the City Winery include Eric Burdon and the Animals, Blue Rodeo, Jim Peterik, Howard Jones and Will Hoge. 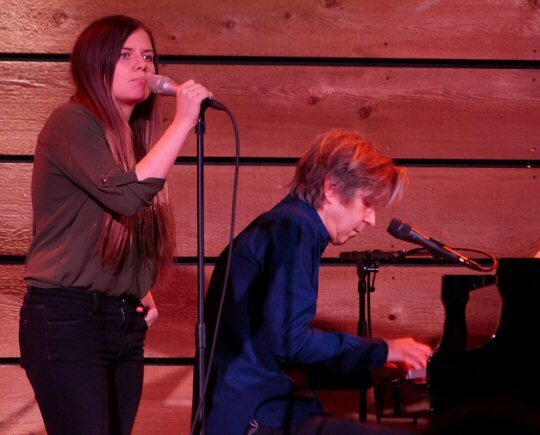 Eric was joined by his friend Arielle on a song they wrote together.